One of the hardest things about going low-carb is having to exercise extreme moderation or eliminating altogether some of my favorite things in the world. Like hunks of Celebration and Chocolate Marble cake from SusieCakes. Not to say that I haven't been to SusieCakes since starting my meal plan (Samuel's birthday was definitely the 3rd), but I kept it reasonable. Instead of a lifetime supply of cake in the form of one gargantuan (albeit delicious) slice of cake, I had a cupcake and kept it moving. But the one thing I hadn't been able to do? Pizza. I love me some pizza - Pizza Hut or Blaze Pizza used to make a weekly or bi-weekly appearance prior to the #mealpreplife. And as much as #iffym (if it fits your macros) is a thing for me, some foods just make it really difficult to bounce back and round out macros for the day. You guessed it - for me, Pizza is one of those foods. So I took to the internet, wondering if there was such a thing as low-carb pizza that actually tastes like pizza. Not some protien-crust infused monstrosity that I'd have to delude myself into thinking tastes like protein - but a legit delicious crust that looks, tastes, and feels like pizza crust. I discovered tons of low-carb and keto websites talking about something called "Fat Head Pizza", and I'm not gonna lie to you guys - I didn't have the desire to research the backstory on why it's called that, the documentary it came from, or why any of that even matters. Sometimes, I just need the solution. 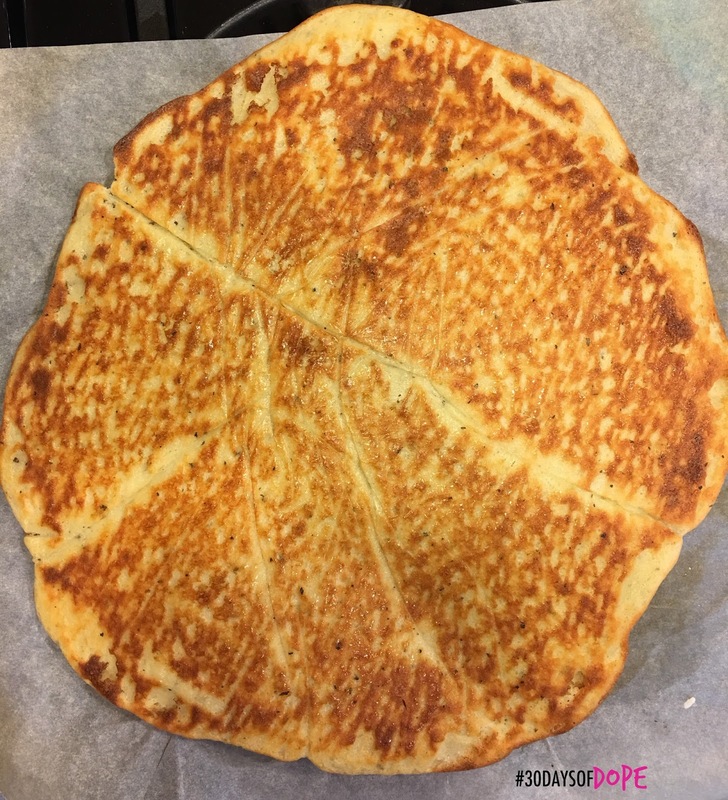 So without further delay, I'm gonna hit you with the recipe and how-to for my newfound favorite pizza crust that allows me to enjoy a MUCH more reasonable version of one of my favorite fork-less foods. Top Row: Ingredients for my Jamaican Jerk Pizza. Bottom Row: Ingredients for pizza crust. 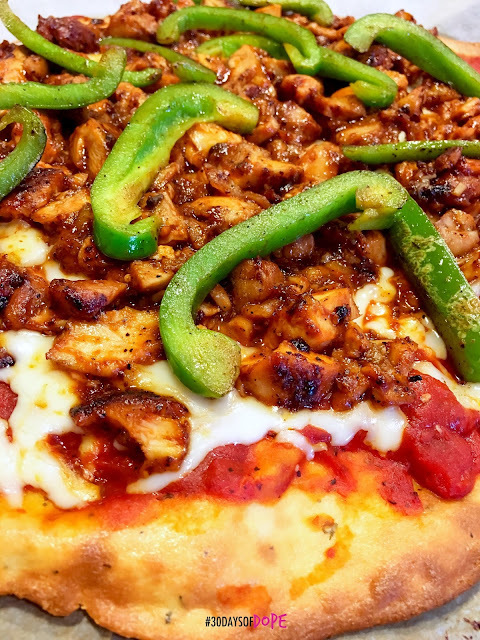 The key to this pizza is to fully prepare the crust and toppings first. Pre-heat your oven to 400F. While your oven is heating, take the time to prep your toppings. If you're going to be using meats like chicken, shrimp, sausage, etc - cook them first. 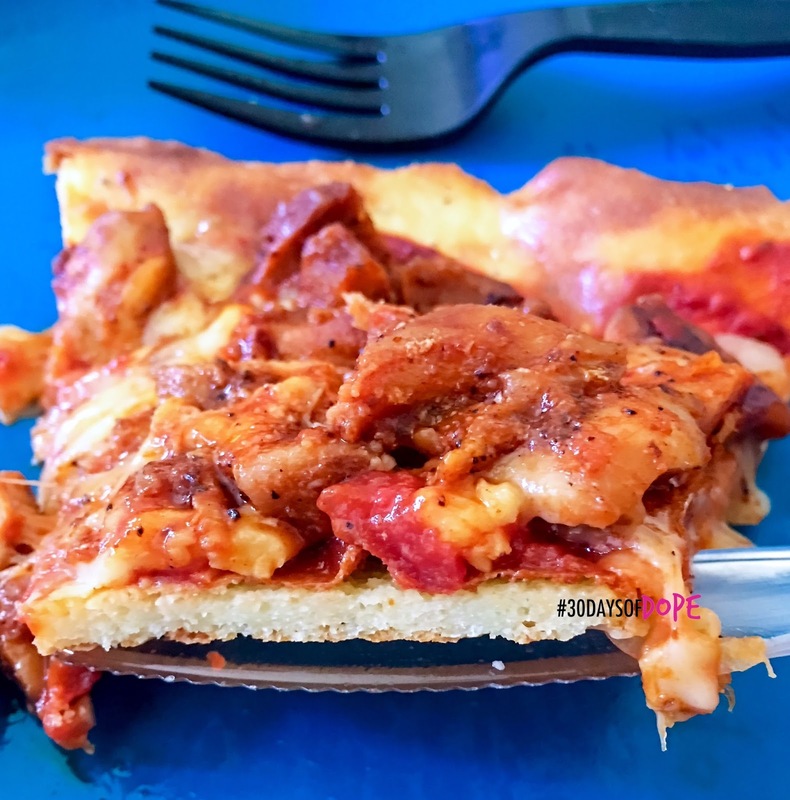 For my BBQ Chicken Pizza, I cooked the boneless, skinless chicken thighs on the stove, then chopped them and mixed in the Sweet Baby Ray's BBQ Sauce. Sautee any veggies (I did a quick sautee on the bell pepper as well), and shred cheese (if necessary). Also prepare your sauce over low heat. Set aside. In a small, microwave-safe bowl, combine the mozzarella cheese, almond flour, and cream cheese. Do not mix - just toss the bowl in your microwave on HIGH for 1 minute ONLY. Remove the bowl after 1 minute and stir with a non-stick spatula. If your cheeses have sufficiently melted enough to soften and start taking the shape of a dough, do not put it back in the microwave. If it has not, put it in the microwave again for another 15-20 seconds - but no more than 30. It's super important to not overcook the cheese in the microwave. I find that 1 minute is enough time. Once your cheeses have melted, begin mixing to form dough. 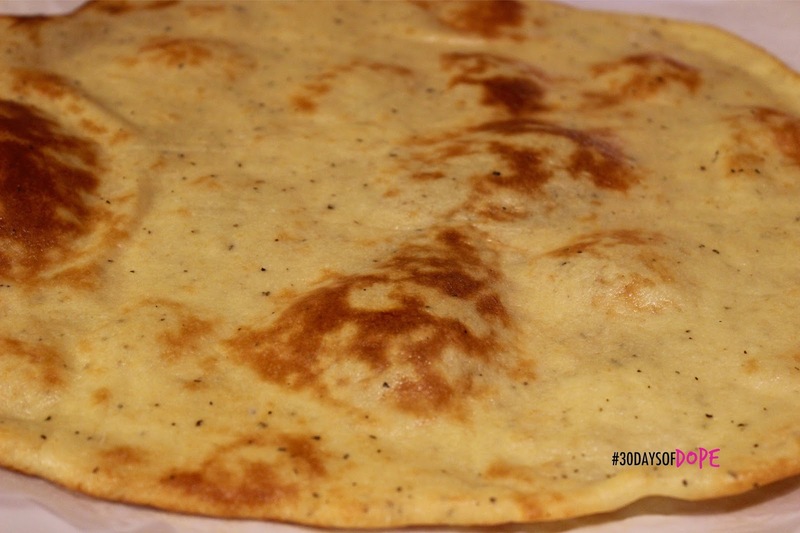 Fold in 1 egg and your seasonings (optional). At this stage, I find it works best to knead the dough by hand. Kneed the dough into a ball. 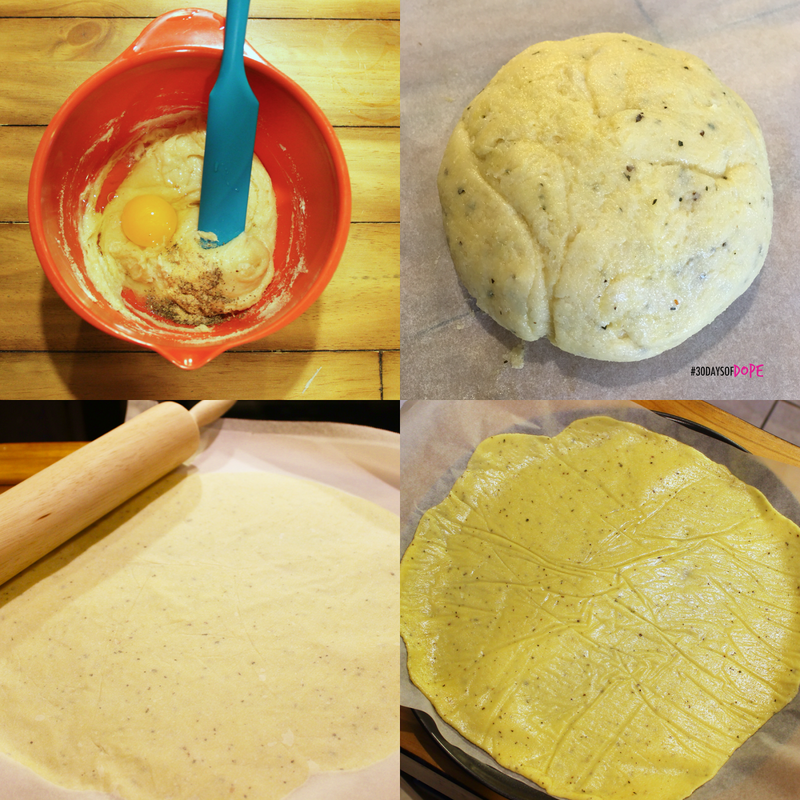 After mixing your dough, grab two long (at least 16-20 inches) sheets of parchment paper. 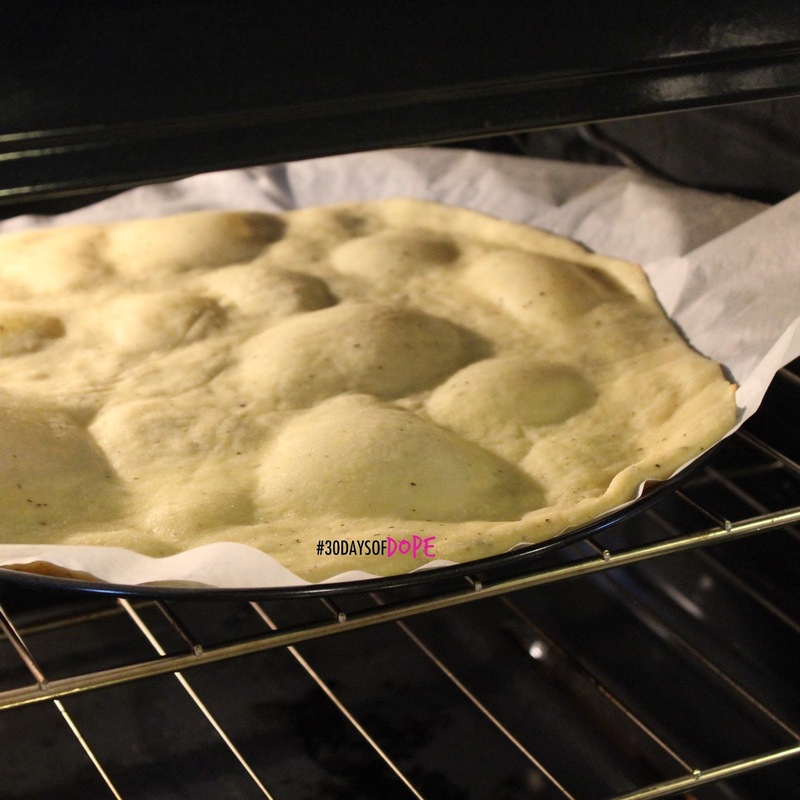 Place the dough between the two sheets, and use your rolling pin to flatten the dough into a circular crust (or shape of preference). Feel free to roll the dough as thick or thin as you like - I prefer the dough on the thin side to make more generous slices. Once you've achieved the desired thickness, remove top sheet of parchment paper, and place the crust (with parchment paper still underneath), onto your baking sheet or pizza pan. Bake on 400F until the crust begins to brown (about 12-14 minutes for thinner crust). Remove crust from the oven and set aside to cool for a moment. DO NOT turn your oven off yet. 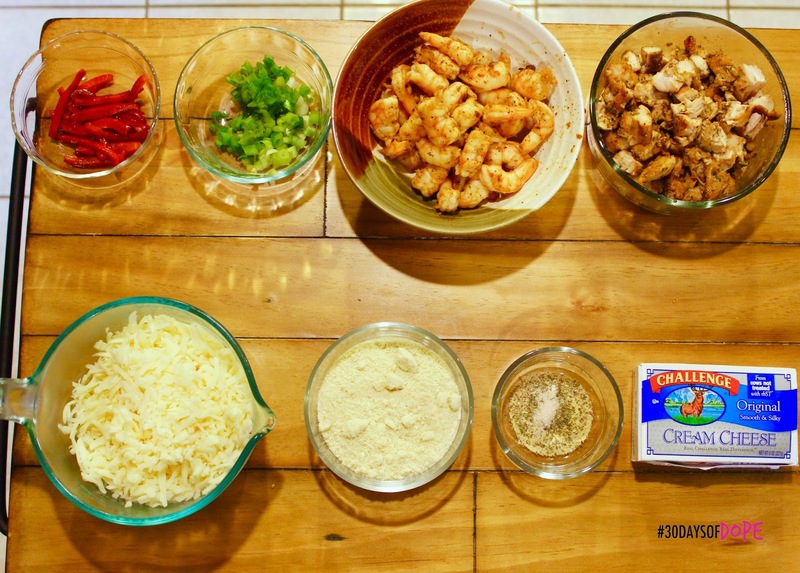 Gather your sauce and toppings that you had previously prepared. For my BBQ Chicken Pizza, I spread the Tomato Basil Marinara evenly around first, following up with mozzarella cheese. After that, I distributed the BBQ Chicken and bell peppers. Once your pizza has been crafted, pop it back in the oven for another 5-7 minutes - enough to melt the cheese down. 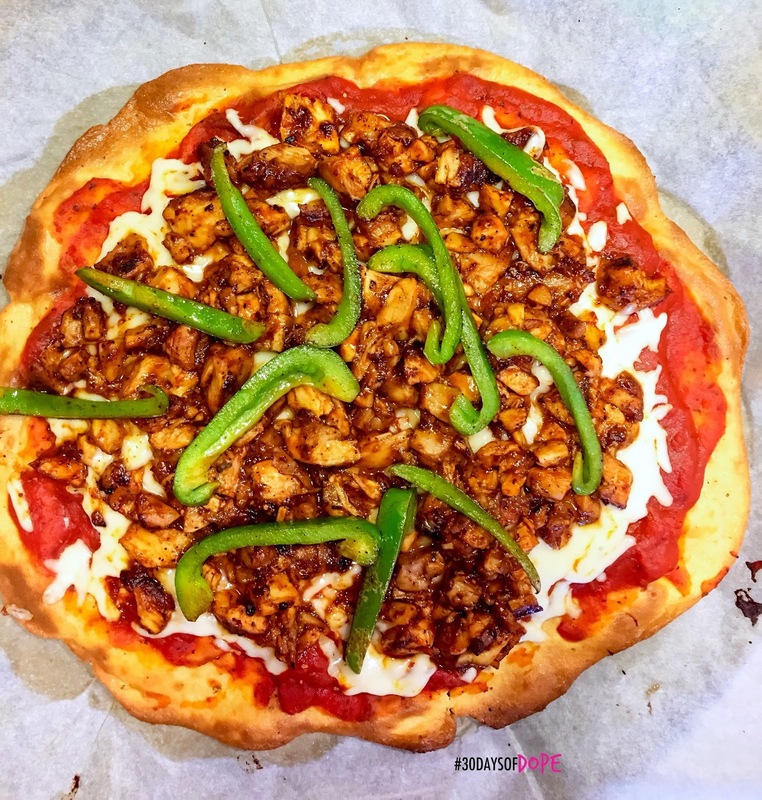 That's why it's important to prepare your toppings ahead of time - the amount of time required for them to cook in the oven would cause the crust to burn. Remove, cool a little (until the cheese stops actively bubbling), slice and enjoy! 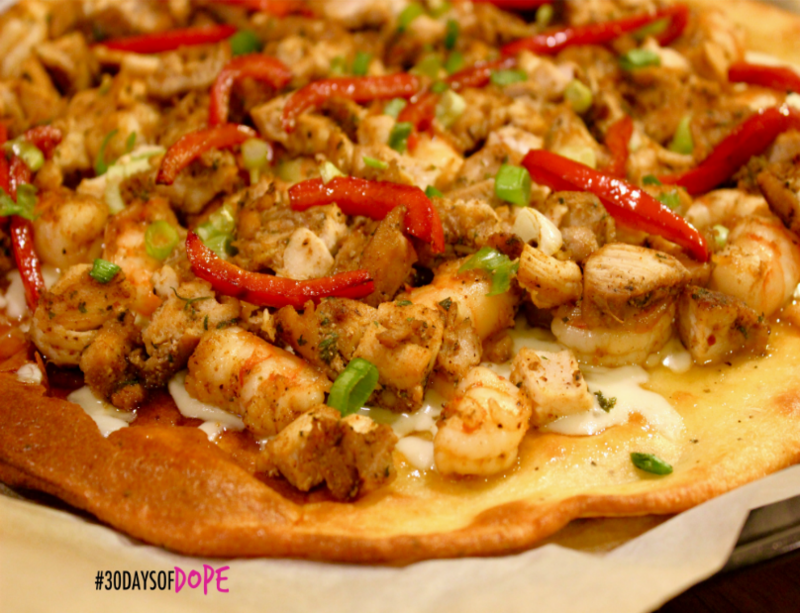 A lil' closeup on BBQ Chicken Pizza realness. A cross-section of the crust. Looks, feels, and tastes like regular crust. Tip: If you want to further cut carbs and fat, try experimenting with 2% mozzarella on top of the crust and eliminating sugary sauces. But overall, we're talking less calories, A LOT less carbs, a little less sugar, and more protein. Not a bad deal at all! And not to mention - it tastes GREAT! I'll take this pizza over Pizza Hut ANY day. Plus, it doesn't leave me feeling heavy and sluggish...and it's KID & GROWN FOLK TESTED! I gave the BBQ Chicken and Ham & Cheese pizzas to my newphews over the weekend, and they LOVED it. Samuel loved all three - BBQ Chicken, Ham & Cheese, and his favorite is the Jamaican Jerk Chicken & Shrimp. My sister was mad skeptical at first - but she sho' did grab a slice of BBQ Chicken when dropping off my nephews, and a slice of Ham & Cheese when picking 'em up. Lol. If you try this one out - let me know on Instagram or in the comments below!